People always say your wedding will go by fast, but you never believe them. We know the brides at The Park Savoy Estate plan carefully and want their gorgeous wedding to last forever, but it goes by fast for them too. The good news is that you don’t have to lose touch with your friends and family once the wedding is over! After your wedding, you’ll need to write thank you notes to thank all of the guests for coming and celebrating with you. Looking at the pile wedding presents and generous gifts you received can seem overwhelming, but you’ll get through it! The task can seem daunting, but you should write your wedding thank you notes as soon as possible. People traveled from all over to celebrate with you and it’s important to thank them for their generous wedding gifts and time. In fact, planning to write the perfect wedding thank you notes starts before you even get married. 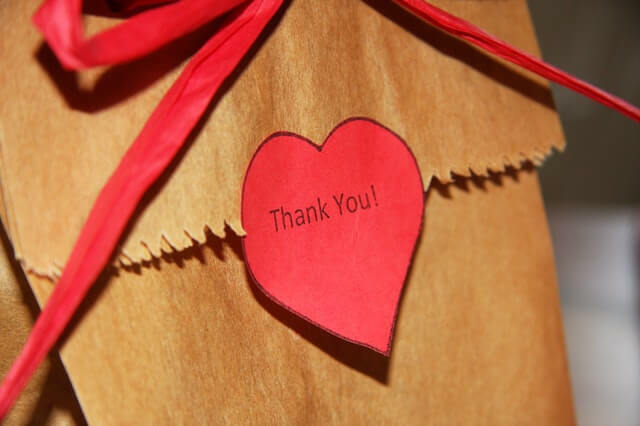 Make a copy of your guest list and add columns for gifts and thank you notes to ensure you don’t miss thanking anyone. Be sure to track any wedding gifts you receive ahead of time on there as well. Everyone that attended the wedding, helped plan, or sent a gift should receive a personalized thank you note. Before sitting down to write thank you notes after your wedding day, you get to have a little fun! Invest in cute stationery or thank you cards that represent you as a couple. If you had a theme or specific color scheme for your wedding, it’s a nice touch to incorporate that into the stationery you choose. A recent trend on the rise that can make your wedding thank you notes stand out is customizing stationary with wedding photos through online photo and print services. After selecting your stationery or thank you cards, you’ll also need some nice rollerball pens that will not smear or bleed through and a roll or two of stamps. Once you’ve gathered all your supplies and gift list, find a comfortable spot and set up shop! Once your space is set up, it’s time to get to work. Now comes the tricky part of determining what to write. The nice thing about wedding thank you notes is that they should be thoughtful, not lengthy. Be sure to include the name of the person who gave you the wedding present in the beginning to add a personal touch. If the gift came from a group then each person will get a separate note. When writing the body of the wedding thank you note, don’t start off with the actual thank you. Tell your guest that you enjoyed seeing them, or share a special memory you have of them from the wedding. Then be sure to express your gratitude for the gift. If you received a specific item, mention it in the note and explain how you’re looking forward to using it. If you received cash as a wedding gift, you can tell the recipient how you’re going to use the funds in the future, but refrain from acknowledging the specific amount. While working, keep in mind that not all your wedding thank you notes need to be written in one night. Writing the perfect thank you notes after your wedding takes time and if that task becomes overwhelming, it’s okay to take a break. Simply keep track on your spreadsheet who you have already written to, and you can get back at it the next day.